He is the author of eleven books including the book titled The ABCs of Child Injury – Legal Rights of the Injured Child – What Every Parent Should Know. The latest book – Watching Out for Motorcyclists – Freedom, Liberty, and Justice – Legal Rights of Injured Bikers, was published in 2017. He serves as Editor for the Child Injury Lawyer Blog. As a child injury attorney and child safety advocate, Mr. Wolf has been interviewed by a number of publications including Time Magazine. Over the years, Mr. Wolf has authored a total of 4,000 articles focusing on child injury and safety issues. Over the past 27 years, Mr. Wolf has garnered praise by clients, colleagues, and judges. He is an AV Rated Attorney by the prestigious publication Martindale Hubbell. 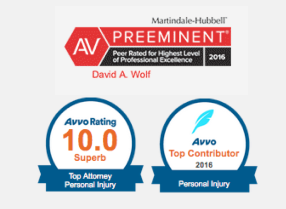 AV Preeminent is a significant rating accomplishment – a testament to the fact that David Wolf’s peers rank him or her at the highest level of professional excellence. The Legal Ability ratings are based on performance in five key areas: Legal Knowledge, Analytical Capabilities, Judgment, Communication Ability, and Legal Experience. Mr. Wolf is rated a 10.0 on the Avvo Rating System which evaluates a lawyer based on the information available an attorney’s Avvo profile and other sources including client reviews, attorney endorsements, and data provided by the State bar association and other sources. In 2015, Mr. Wolf received the Avvo Client’s Choice Award and the Avvo Top Contributor Award for his postings and written contributions to the Avvo Website. The Jacksonville Jewish Community Alliance is a non-profit organization and community center located in Jacksonville, Florida. The JCA provides top quality programs, special and cultural events, sports programs, early childhood education, and summer camp programs. Mr. Wolf was appointed to the Board of Directors in 2009. In 2010, Mr. Wolf was awarded the New Leadership Award. In 2012, he was appointed to serve as the Treasurer. He served in this position for the next 3 years. In 2014, Mr. Wolf was honored to receive the Esther Leah Ritz Emerging Leadership Award. This award was given to 50 leaders throughout the United States and Canada. 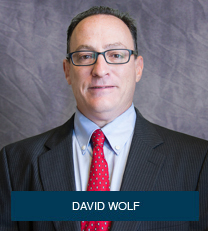 In 2015, Mr. Wolf was appointed to the position of Secretary of the Board and currently serves on the Executive Committee. In 2016 – 2017, Mr. Wolf served the Jacksonville Jewish Community Alliance in the position of Vice President.